My friend, Jim Faughn, has written a most insightful article regarding the work of shepherding in the Lord’s church. How very needed are the things he has discovered to be practiced by all shepherds, elders, bishops in the Lord’s church!!! This is outstanding advice both for those who serve in this vital role and to those who serve under them. As the work of the church in general and the elders in particular were discussed, I had listened to members of those congregations as they expressed support for or concerns about what “they” did. I had heard what the members liked and what they didn’t like about “them.” In fact, I had my own opinions about these matters. While I did my best to keep these opinions to myself, I still had them. I could see (or at least I thought I could see) all kinds of ways that the work of the Lord could be done better if “they” would handle their responsibilities differently. Now that “they” is “us,” I hope you will indulge me as I share some things I’ve learned first-hand. Hopefully, these thoughts will provide some insight into something that looks a whole lot less difficult on the outside than it does on the inside. The term “elder” is not synonymous with the term “infallible.” Nobody knows this better than the men who try to serve the Lord and a local congregation as elders. There are times when the judgment of elders could be better — sometimes a whole lot better. At those times, please be patient with us, communicate with us, and work with us. We are, after all, all on the same team. Please accept our “humanness” and realize that we are doing the best we can do. Most importantly; please pray for us. Until and unless you’ve been here, you will never know how much we need your prayers. It would help to be a trained juggler. While our primary concern is to please the Lord, elders constantly feel the pressure of trying to juggle the needs and desires of various age groups and people of various economic, educational and social levels. In addition to these factors (and many others), elders are constantly dealing with people who possess different levels of spiritual maturity. When it appears that a ball has been dropped, maybe, instead of pointing that out, it would be better to help pick it up. Better yet, how about helping us carry the load so that the ball is not dropped in the first place? The Maytag repairman would have a heart attack in his first month as an elder. If the commercials are correct (and who would ever doubt the information in a commercial? ), the fictional Maytag repairman doesn’t have much repairing to do. I wonder what he’d do if he had to try to “fix” relationships, feelings, consequences of sin in people’s lives, programs, budgets, etc. He might not look quite as relaxed as he normally does. In fact, we might be visiting him in the Cardiac Care Unit of one of the local hospitals. When you’ve seen one, you have not seen ‘em all. This one is a two-way street. Sadly, some members of a congregation think that everything is “settled” when they talk to only one of the elders. The responsibility is in the hands of an eldership, not just one elder. Please do not ask one of us to “carry the water” for you. We all want to hear what you have on your mind and we need to hear it from you. There does not need to be any misunderstanding. At the same time, the eldership has not made a visit, expressed concern, spent time with somebody who needs to be encouraged, etc. when only one elder has done these things. All too often, one man becomes the “head elder” by default because he is the only one the members of the congregation see at hospitals, funeral homes, and at other times when they truly need a shepherd. Shepherding is a wooly job. 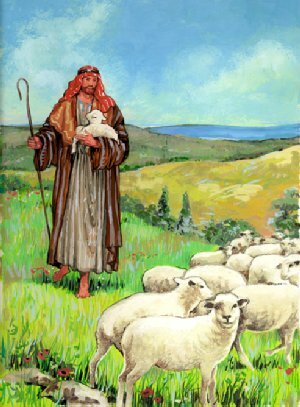 I’ve not been around many (make that any) shepherds, but, if I met one, I would not be surprised to find traces of wool on his clothing. Shepherds are in contact with the sheep. Effective shepherding cannot be done at arm’s length. It is my firm opinion that the shepherds of God’s people today should regularly read and faithfully seek to apply the information we read about the Good Shepherd in John 10. Sheepdogs cannot do the job of shepherds. A corollary to the last point is that elders cannot hire a preacher to do their shepherding for them. All too often, the modern “system” looks like the one in which shepherds (elders) obtain the services of a sheepdog (preacher) to keep the flock safe and where they are supposed to be. I often wonder how much more evangelism an “evangelist” could do if he wasn’t expected to be the sheepdog. Board rooms are not as effective as living rooms, family rooms, or dining rooms. Decisions are made in board rooms. People’s lives are touched in living rooms, family rooms, and dining rooms. I have some very strong opinions about what criteria the Lord will use to judge elders. Those strong opinions have absolutely nothing to do with most of what goes on in board rooms. They have to do with how well the shepherds know the flock and how important souls are. On the Day of Judgment I seriously doubt that there will be any “extra credit” given to those elders who had an impressive budget and who met it every month. It is almost impossible to push a string. Whatever the elders’ dream for a particular congregation is, we need to take the lead in that. We do not need to be making assignments, checking flow charts, etc. If we want the church to be more evangelistic, we need to be more evangelistic. If we want the church to give sacrificially, we need to give sacrificially. Whatever it is that we would like to see the church doing, the members need to see us doing. You can lead a horse to water, but you can’t make him drink. Are there verses or parts of verses in God’s Word that trouble you? Here’s the one at the top of my list since the day I became an elder: “…they watch for your souls, as those who must give account…” (Heb. 13:17). I live every day with the realization that I am accountable to the Lord for the souls of scores of people and that I can do nothing to force, coerce, cajole, threaten, or entice them in such a way that I can guarantee that their relationship with the Lord is as it should be. Try living with that one for a while and see how many sleepless nights you have. She’s not behind me; she’s alongside me. While there is no particular order to these thoughts, I did save the best until last. The well-known saying is that “behind every successful man, there is a good woman.” Elders’ wives are not behind them. They walk alongside them and make the journey much easier by so doing. While I do not believe that it is appropriate to put the elders’ wives behind them, it is also wrong for her to walk ahead of him and “do the job” for him. Believe me; this is a real temptation. There are times when it would be very tempting to “pass the buck” or let somebody else “take the heat,” but it is neither the loving thing for a husband to do nor is it scriptural. It is altogether appropriate for the wife of an elder to accompany him on any number of his visits, to assist him by having people into their home, and to find other ways to support him, but He needs to be the one doing the shepherding, not her. While you are praying for elders, please do not forget to pray for their wives. Very often, their husbands cannot let them know what is troubling them because they would be betraying a confidence and/or causing her unnecessary pain. Often all that an elder’s wife knows is that the man she loves is hurting or troubled in some way and she’s doing all she knows how to do to help him. You might even consider putting your prayers into action and asking one or more of the godly women who serve “in the shadow” if they’d like to have lunch, go shopping, or “just talk.” You might be an answer to her prayer. So, there you have it — at least for now. I’m sure that, given enough time, my list will change somewhat. I just thought that it might be beneficial to read one person’s thoughts about what he has learned in the past few years. I pray that I will keep learning and will be a more effective servant of the Lord in whatever capacity He and His people allow me to serve.